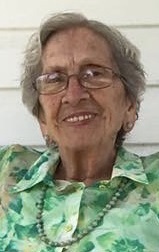 Wanda Williams Helm, age 85 of West Paducah died Friday, March 29, 2019 at her residence. She was born the daughter of the late Thomas Barry Williams and the late Cleo Harrington Williams. She worked for Wrangler Clothes Company in Oklahoma. She was a member of the Ladies Auxilary VFW and the Ladies Auxilary American Legion of Princeton, KY. She was of the baptist faith. No services are scheduled at this time. Keeling & Goodman Funeral Home is in charge of arrangements. She is survived by her son: Donald Ray Summers of Princeton; her daughters: Kathie Mae Carman of Paducah, Evelyn Diane Summers of Van Austen, Texas, and Sheila Ann Merritt (Scott) of Plano, Texas; her six grandchildren: her eleven great grandchildren; and her four great-great grandchildren. In addition to her parents, she was preceded in death by her husband: Larry Clayton Helm; her son: Jimmy Dale Summers; her brothers: Thomas Williams, Clarence Williams, and Homer Williams; her sisters: Doris Wheeler, Betty Watson, Marlene Williams, and Merldene Williams.